At Chez-Del, our showroom features 3 levels, filled to the brim with inspiring colors and styles to bring to your home. We recently brought all our galleries and pieces under one roof, consolidating Chez-Del into one, conveniently located destination for quality, stylish home furnishings and decor. 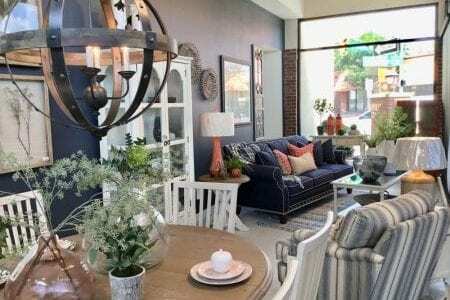 Just a 25-minute drive from most Canton and Cleveland suburbs, our Akron furniture store showroom features lifestyle galleries displaying unique and interesting pieces. We hand-select each piece of furniture, and carefully choose every decor and style item we offer. When it comes from Chez-Del, you won’t find it in anyone else’s store or home. Throughout the showroom, lifestyle galleries highlight your style, whether you prefer casual elegance, urban classic, uptown loft, or euro countryside for your home decor. Our showroom also contains Home Accents from around the world, a seasonal Outdoor living gallery, Rug display gallery, Sleep shop with multiple mattress options and so much more. Our talented team of designers, each of whom can be found on-site in our showroom, is available to help you navigate our galleries and find just the right accents and furnishings to complete your home design masterpiece. No matter what room you’re looking to work on, whether you need a new accent lamp or you’re redecorating an entire home, the showroom at Chez-Del has what you need to make it special.